Fabulous New Construction Split Level w/- 3 car, attached garage; Spacious 4 bedrooms; 2.1 bath Split Level in desirable Macomb Township and Chippewa Valley Schools. 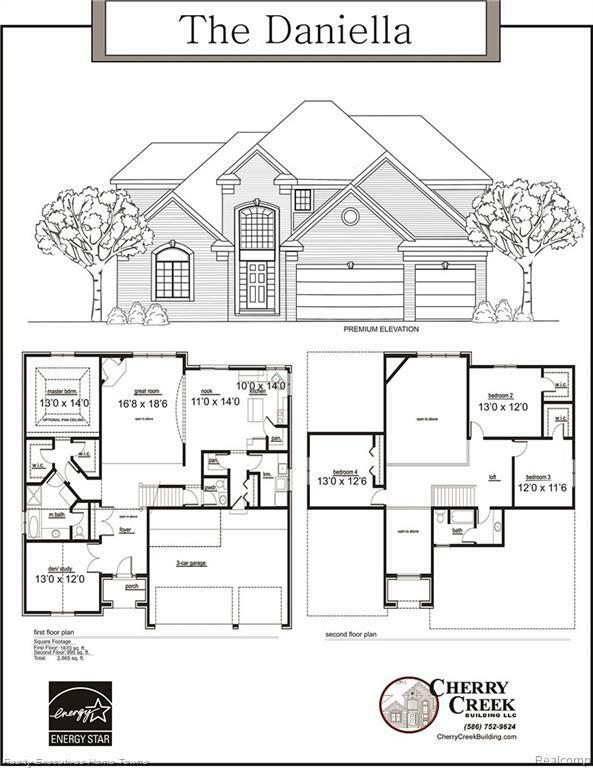 Quality Builder - features include: upgraded cabinet pkg, granite throughout, $2000 appliance voucher, $3000 sod/sprinklers allowance; jetted tub, custom tile flooring, gas/direct vent F/P. Elegant study near front entry with French doors. Stunning rod iron staircase with stained banister. Expansive great room with gas, direct vent F/P. Spacious kitchen with custom cabinetry, granite, and pantry. Beautiful first-floor master bedroom with on-suite jetted tub, large vanity, stand-alone full tiled shower, and his & hers walk-in closets. Close to Macomb Twp Recreation Center, shopping, parks and conveniently located near all major expressways. Why wait to build? You will not be able to duplicate this house at this price with all these outstanding features at no extra cost!